As Manchester Airport continues to grow and offer more routes and destinations, we are investing heavily in improving the site to manage the increased demand and to improve the customer experience. One aspect of this will be creating 270 new spaces in our Terminal 1 Arrivals car park by adding in two new levels, with additional entrances and exits. To facilitate this, the current Terminal 1 Arrivals car park will close from 01:00 on 26 November 2018 and will reopen in April 2019. Your return instructions have been updated to reflect this. 1. When you reach the entrance to the car park, please follow the instructions on the digital information screen. 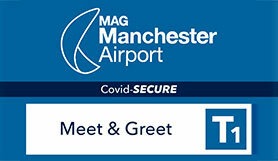 On your return, please go to the new Meet & Greet collection point which is located in the Terminal 1 arrivals hall, opposite Greggs. Your car will be parked on Level 13 of the Terminal 1 Multi-Storey car park which can be reached by the lifts located to the side of the collection point. Meet & Greet staff will be on hand to assist.